Years ago I heard about AJ Bombers, a restaurant in Milwaukee, and their Foursquare strategy. Since then, in every one of my social media classes I bring a case on AJ Bombers. By using Foursquare, AJ Bombers increased their sales by 110%. Yes, you read that right, 110% increase in Sales by using a geotagging service. If you are looking to see the direct connection between social media and ROI, even back in 2010, Foursquare would give you direct results. This is why I still love Foursquare, despite Foursquare’s misstep in business strategy (we’ll wait for another blog post to speak about that). Below are my 10 Tips to creating a valuable customer experience that will turn any customer into a loyal customer. Since moving to Chicagoland from the Northeast my boyfriend and I have been trying to travel throughout the Midwest and see places we have never seen. We took a drive up to Milwaukee because the Celtics were in town and he loves basketball. Despite the loss, we had a great night out in Milwaukee. The next morning we decided that it was time for brunch and since we were in a new city and didn’t know the area, we of course went onto Foursquare to look for the best Brunch spots. Low and behold AJ Bombers came up. I immediately remembered how many times I had used the restaurant as a case example in my courses. 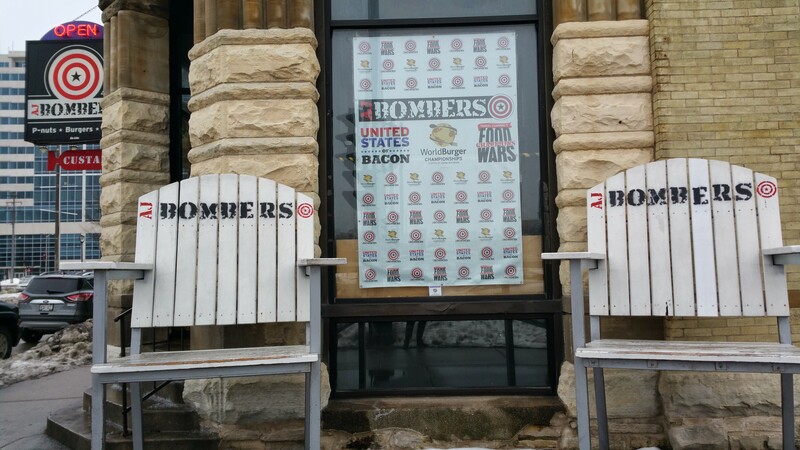 AJ Bombers was a great example of social media and how to do it right. When we arrived to AJ Bombers it was an experience from the beginning. From the looks of it, the “P-nuts. Burgers. Beer.” Restaurant looked like a dive, but was super cozy. The employees were super friendly and helpful. It was clear that the server and hostess were relaxed and really enjoyed being at work. Typically, I ask a lot of questions in life, but especially in restaurants. With enthusiasm, the server answered each one of my questions. Not only did she answer my questions, but she even gave me detailed explanations and followed up with recommendations. It was clear that she was passionate about the AJ Bomber brand and valued it. It was impressive. We sat down and I immediately checked into Foursquare… obviously. Once I did, a message popped up from Twitter in my Foursquare app. It was interesting to see the integration between Twitter and Foursquare. I had never seen a brand bring Twitter into Foursquare, it was usually Foursquare showing up in Twitter or Facebook. OR typically you see Foursquare stand alone, if at all. But AJ Bombers really aligned their marketing channels on social media and even on the menu (See: Tip #6). And then… it just kept getting better…..
We ordered Bloody Marys that really were one of a kind. In the glass was a quarter of a bacon cheeseburger. This was the first time I had seen a cheeseburger in a Bloody Mary. It made sense because AJ Bombers was known for their cheeseburgers, so why not give people a little taste of what’s yet to come? What made the Bloody Mary even better? They made their own Bloody Mary mix that was delicious. It had just the right amount of spice and thickness. On top of the cheeseburger and the delicious drink, they gave us a “shot” of Miller Light (we had the choice of Miller Light or Highlife). It was a lot for a Sunday morning, but it was memorable with just a little more TLC. Not only did AJ Bombers have amazing Bloody Marys with a side of Miller Light, they also had a burger that included peanut butter on it. Although we didn’t try it, the waitress was raving about the Barrie Burger. This was interesting to read about. The idea of putting two very separate items together to create a product is innovative. In today’s world, it’s important to be innovative to differentiate yourself from the rest. The menu was also used for marketing to their loyal customers. While looking at the menu, we noticed that they incorporated a hashtag and a Twitter handle into one of the menu items. It was very creative to give the loyal customers another touch point to discuss the brand and pinpoint the heavier social media users as well as potential brand advocates. AJ Bomber’s really understands integrating their marketing and really aligning their brand across all touch points. Their multi channel marketing is subtle but useful. If that wasn’t enough, there was a track on the ceiling that transported peanuts from the bar across the restaurant. The bartender was sending bowls of peanuts to other parts of the restaurant that didn’t have access to peanuts. It would have been easy for AJ Bombers to just put buckets of peanuts all over the restaurant, but instead they took it up a notch by creating entertainment. Also, a connection was created with the bartender for those that were not in a close proximity to the bar. Mind you again, all of this has happened before we have even tasted our food. This is the true definition of Customer Experience. It is differentiating your brand and giving the customer more than what they are asking for. The food was outstanding as well, which is probably why AJ Bombers has won so many awards including placing 17th in the World Burger competition. The food was so good, that I forgot to take a picture, sorry. This is all we had left…. As we were leaving AJ Bombers with full belly’s and smiles on our faces, we noticed all of the awards they won. It was no surprise to us since the minute we walked in was really pleasant, but AJ Bombers was not afraid to show all of their achievements. They put them on the window so as soon as people walked in, they would be able to see that they were going to an amazing place. In an effort to help increase brand awareness, give people products to buy to help them showcase your brand! AJ Bombers was an exceptional experience! From a mere case study that I brought up in my classes to an experience that I am writing about now. This is true customer loyalty when a customer starts advocating for a brand. I even bought a sweatshirt! If you ever have the chance, definitely hit up AJ Bombers! And don’t forget to tweet to them!